Is Florida’s No-Fault Insurance Law On The Chopping Block? Once again, the Florida Justice Association is asking lawmakers to repeal the Personal Insurance Protection requirement and make Florida a tort state in terms of car crash cases. The State House may consider such a measure before Valentine’s Day 2018, and the full Senate is expected to follow suit shortly thereafter. Individual drivers would see little or no change in their insurance bills, since instead of paying for PIP protection, they would pay for liability insurance. Currently, only owners with poor driving records or a criminal background that includes certain traffic infractions must carry such insurance. FJA President Dale Swope said that no-fault insurance has not kept rates low (Florida has the sixth-highest insurance premiums in the country) so it’s time for Florida to join the other thirty-eight states that have a tort system. On the other hand, Personal Insurance Federation of Florida President Michael Carlson predicted that if the Legislature repeals the no-fault law, the number of suits will increase and consumer costs will go up even further. PIP protection only pays for medical bills, and lost wages. Compensation for victims is limited in “fender bender” cases that involve only mild or moderate physical injury. In many cases involving minor property damage, the injuries did not go beyond the serious injury threshold. Loss of Function: This rule usually applies to sensory losses, such as eyesight or hearing, as well as mobility impairment. The “loss of function” need not be complete, but it must be at least somewhat significant. Scarring: Generally, the scars must be on the face, arm, or some other visible part of the body. Juries often award more damages to female scarring victims than men. Permanent Injury: Most no-fault exemptions rely on this third area, since among adult victims, most injuries never heal 100 percent. For example, quarterback Joe Theismann broke his leg in an infamous Monday Night Football game. The break healed, but he still walks with a limp to this day, because one of his legs is a little bit shorter than the other one. The additional compensation in these cases includes money for loss of enjoyment in life, pain and suffering, loss of consortium (companionship), emotional distress, and other noneconomic damages. In some cases, the victim need not suffer a physical injury to obtain such compensation. Both the House and Senate versions would slightly increase the auto insurance minimum coverage levels, which are currently among the lowest requirements in the country. So, under current law, the tortfeasor (negligent driver) may not have enough insurance coverage to provide fair compensation, especially in catastrophic injury claims. Employer Liability: Typically, if the tortfeasor was a truck driver, taxi driver, bus driver, or other commercial operator, the employer may be responsible for the victim’s damages. Alcohol Provider Liability: Similarly, bars, restaurants, grocery stores, and other commercial providers in Boca Raton may be held liable for damages if they sell alcohol to underage or some adult consumers who later cause car wrecks. 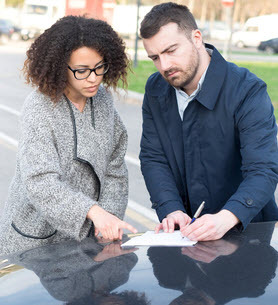 Owner Liability: The negligent entrustment rule may apply to vehicle owners who let unqualified drivers borrow their cars. The rules are a little different in commercial negligent entrustment cases, because of the federal Graves Amendment. If there are multiple responsible parties, the judge usually apportions damages among them based on their percentage of fault. Serious injury car crash victims are often entitled to significant compensation. For a free consultation with an experienced personal injury lawyer in Boca Raton, contact the Leifer Law Firm. We do not charge any legal fees or costs in negligence cases unless we recover money for you.